The programme was launched by the Martyrs' Families' Affairs Office of the Abu Dhabi Crown Prince's Court, in cooperation with Sandooq Al Watan, to discover gifted students, assist them in their future career choices, and identify their potential employment challenges. 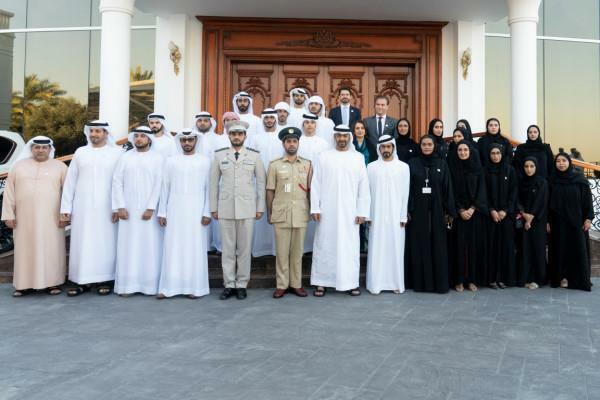 During the meeting, which took place at the Qasr Al Bahr Majlis, His Highness Sheikh Mohamed bin Zayed, accompanied by Sheikh Khalifa bin Tahnoun Al Nahyan, Executive Director of the Martyrs' Families' Affairs Office, discussed, with the students, their future aspirations and how they can benefit from practical and training programmes and other opportunities. His Highness Sheikh Mohamed urged the children to work hard, achieve excellence and benefit from available opportunities, to strengthen their academic results and prepare them for the future while stressing that the children and their families are being supported by President His Highness Sheikh Khalifa bin Zayed Al Nahyan and the country's leadership, who aim to enhance their capabilities and empower them to contribute to the nation's development and future.